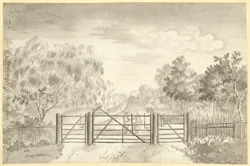 View at the gates of Madingley Park, which is now part of the buildings of Cambridge University. The estate house was a Tudor brick mansion, built by the Hynde family and the oldest ranges are from the south and east ranges which were built by John Hynde in c.1543. During the 18th century there was further building work and Capability Brown was commissioned to landscape the grounds in 1756. The artist Miss Cotton, was a relative of the owner Sir St. Vincent Cotton, Bart.